“Celebrate The Game!” is displayed prominently across the webpage for ScotiaBank Hockey Day In Canada. This is a major promotion for the CBC and the NHL and it was appropriate that the final game of the night showed the type of play that the league has ignored, tolerated and supported. Vancouver and Calgary waited an entire 2 seconds after the opening face-off to give us “Slapshot 2014”. The game ended with 204 penalty minutes – 142 minutes with 8 game misconducts in the first few seconds. It also featured Canucks’ coach John Tortorella charging the Flames dressing room corridor in an attempt to get to Flames’ coach Bob Hartley. Both coaches tried to present reasonable arguments on their starting line-ups – reasonable as long as you are indoctrinated in the NHL’s culture of intimidation. "Those guys are playing well for us. They got us a goal last game. We're not scoring many goals," said Hartley, whose team has lost 10 of its last 12. "We had zero intentions there. Those guys are playing hard for us. As far as I know they were the home team. They had the luxury to put whoever they wanted on the ice. He decided who he puts on. It is what it is." I’m sure that his decision had nothing to do with the fact that Vancouver was making a lot of noise this week about playing tougher and coming together as a team. In their previous two games the Canucks had racked up 142 penalty minutes as they exacted revenge against Dustin Brown and Jordan Nolan. I am also sure that Hartley’s line-up did not reflect his interim GM’s objective of playing bigger, tougher and with more truculence. His reasons were more than reasonable as you see lots of NHL teams regularly start their 4th line face punchers to reward them for their offensive prowess. “I see the starting lineup and I know the other guy across the bench and it's easy for people to say 'Well put the Sedins out there and it's deflated.’ I can't put our players at risk like that," he said. "With the lineup that (Hartley) had, I am not going to put those types of players at risk, and that's what ensues. So this had nothing to do with not being intimidated, particularly after a week in which they showed that they would not be intimidated. And, if you buy into the NHL’s culture of enforcement and “The Code”, then you know that Vancouver has to put these guys on the ice to protect their stars. But if enforcers are there to protect players then Tortorella should have no fear that Calgary’s 4th line would intentionally injure someone. The fact that he did not start the Sedins is an acknowledgement that he knows the goons are primarily on the ice to generate violence, not stop it. If you believe that there is no such thing as bad press, then the Canucks and Flames did a great job at generating media activity for Hockey Day In Canada. In the first few seconds of this game we got the opportunity to celebrate all of the effort that the NHL and NHLPA put towards building their image. Tortorella is a serial initiator of line-brawls, having been involved in 2 very similar incidents versus New Jersey (while coaching in New York). Go back and look at the press coverage of those brawls and try to find a response from the NHL condemning the violence. I suspect they will shrug their shoulders and take the same action on this latest brawl. Go back and look at game preview stories where players have talked about retribution against an opponent for some cheap shot or perceived slight. Then look for an appropriate response from the league that decries those statements and threatens penalties or fines. Doesn’t happen. 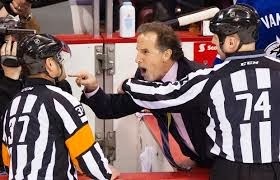 Tortorella may get fined for his antics between periods but none of the on-ice stuff is deemed a problem. The response to all this violence from players, coaches and most GMs is the same. We get consistent comments like, “he has our backs” and “it’s part of the game” and “the fans seem to love it”. 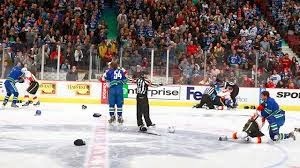 What can the league do to avoid similar brawls in the future? Mandate that only 1st line players can start? Stiffer penalties or fines for teams that fight in the first 30 seconds? My recommendation is a game misconduct for every fight. Opening face-off brawls will likely disappear along with most staged fights between enforcers who need to reinforce their roster spot by lining up against each other. The 4th line rosters spots will likely be filled by players who practice skating, scoring and passing versus those who take boxing lessons. Passion fights will still happen but players will make better choices when faced with getting tossed after dropping the gloves. A clean hard hit will likely be absorbed and ignored while outright dangerous hits or cheap shots will be answered. In the absence of leadership and strategy, the NHL and NHLPA will end up where they deserve. A fringe sport with an image of fighting, brawling and revenge. Awful. Watch soccer or something. Go watch MMA or something. Hockey should not be promoting vigilantism and violence. At least MMA has real consent between the fighters and is not an outlet for avenging a dirty hit or blown out game. Terrible article. Fighting is part of the game. Don't watch NHL hockey if you are so appalled. Euro hockey and NCAA come to mind. You anti-fighting guys aren't real men. You should be ashamed. "You aren't real men" says the man posting as "Anonymous" on an internet blog. Go watch MMA of you like violence so much. In hockey, fighting is illegal. Check the rulebook. A nice to read about the games and sports on control over their sport.